The brakes on all three models of Diablo are identical. 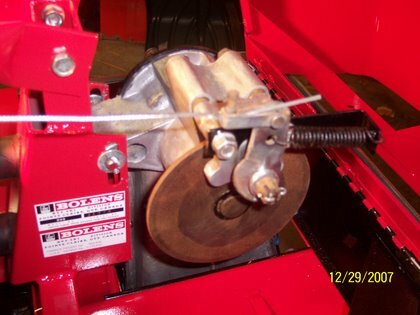 A simple caliper pressing two brake shoes against a rotor which is splined to the input shaft of the gearbox. The weak link on this assembly is the shaft spline mating with the rotor. It is a unique spline design and the teeth often wear down leaving the mating surfaces with a loose fit or even totally strip out. The shaft spline is very slightly tapered up toward the gearbox. To prolong the life of these mating splines, be sure to use the spring “C’ clip which pushes and holds the rotor up the spline taper. Maintenance on this unit is straight forward. Pull it apart and keep it clean. Lubricate the “through the gearbox” bolts so the caliper can slide and maintain a centered position over the rotor. Lubricate the two round push pins. Be sure to reinstall them with the rounded ends outward toward the brake arm lever. Between the brake shoe and the push pins should be a steel disc. Keep the rotor polished clean. For adjustment, locate the arm straight up by adjusting the cable stop. Then remove the cotter pin and adjust the castle nut inward until a slight drag can be felt when spinning the rotor. Reinstall the cotter pin. Brake shoes have not been reproduced for this unit at this time.